Ernest is a young professional that values hard work, family and commitment to the community. He grew up in a migrants family with background in property development and real estate investment. He started as Residential Property Manager in one of the franchise group in Perth, managing more than 200 properties at one time by himself. He then join Quinn Real Estate in Canning Vale as full time sales representative specialising in house, land and unit sales in the area. With the completion of Diploma in Property Services and the successful registration of the triennial certificate with Department of Commerce, He has founded Austpro Properties in 2016. Ernest is also a Registered Migration Agent in Australia. Ernest can fluently communicate in English, Mandarin, Cantonese and Malay. 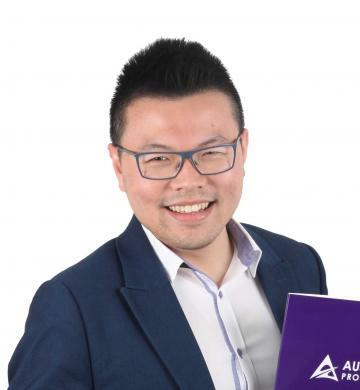 With a diverse background and multilingual ability, Ernest is able to build a strong relationship with his clients and assist those clients in achieving their real estate goals. He is also a strong supporter of WA's Fremantle Dockers in the AFL and a long supporter of Arsenal in the English Premier League. Give Ernest a call today for all your real estate needs. This easy care, neat and tidy unit with light, bright and neutral scheme suits anyone who embraces low maintenance living but not wanting to break the bank. With three-bedroom and one-bathroom, you have the opportunity to invest, nest or downsize. Built by RedInk Homes (Scott Park Group) in 2012, this home is well situated opposite park and playground and it is within the Ranford Primary School zone. The nearest bus stop is within 3 minutes walking distance and the Canning Vale IGA, Livingston Shopping Centre, 7-Eleven Service Station and the Gosnells Golf Club are all within the short stroll. Every descriptive word will fit this immaculate, looks new home in THE AVENUE within 160 m to the lake. It has 271 sqm living area, 345 sqm under the main roof built on a 700 sq block. Simply nothing to be done and you must view it and you will feel the WOW factor the minute you are in. The home features. INTERIOR • A 36C portico with lined cedar ceiling, double security gate and entry door opening to a spacious tiled entrance hall with recess high ceiling. • Carpeted formal dining area. Modern 2 bedrooms 2 bathrooms apartment at the heart of Innaloo! Attention first home buyer or investor! Thinking of moving into a value-added and functional apartment? Do you want to stay within 15 minutes to Crown Casino, Perth Airport and Westfield Shopping Centre? With a friendly budget, you will have the chance to move into this quality built apartment. This first floor apartment is well situated within the bus route to the nearest shopping centre, train station and schools. BRING YOUR OFFER TODAY! NEW PRICE! Are you looking to stay within 15 minutes to Perth city, 10 minutes to Perth Airport and Westfield Carousel Shopping Centre, and short distance to all functional and attractive local amenities such as park, playground, eateries and schools? Look no further as we have bring you your next home! Presenting this immaculate ground floor apartment, featuring high ceiling open plan living and dining area, U-shaped kitchen with stainless-steel appliances and dishwasher, large master bedroom with ensuite, second queen-sized bedroom, main well appointed bathroom, built-in wardrobe, laundry and quiet private courtyard. This apartment is situated at a boutique apartment complex with free communal barbecue facility available for the use of apartment residents. Single under cover carport is attached with the apartment and outdoor storage area is also available. Act now! Inspect this apartment today! Welcome to 67 Watling Avenue, Lynwood. If you want to use two words to describe this property, the best description will be comfortable and peaceful. Why said so? Because this home is well situated on a quiet street with cosy living space. Presenting this easy care renovated unit with 3 bedrooms, 1 bathroom with separate toilet, large living area, kitchen with multiple cupboards, split air conditioning, easy care courtyard with undercover patio, outdoor shed and single automatic garage. This home is situated in short distance to Cecil Andrews College, Haynes Shopping Centre and Armadale Train Station. Home viewing by appointments. Brand New! Looking for new tenant! Brand new home is ready for brand new tenant! Be the first one who live in this newly completed home, featuring 3 bedrooms, 2 bathrooms and double garage. Master bedroom comes with attached ensuite and double built-in-wardrobes, laminated open plan living and dining area, new kitchen with stainless-steel appliances and plenty of cupboards, minor bedrooms come with attached built-in-wardrobe. Paved backyard means no gardening required and bonus outdoor storage is included and for the new tenant to use. This home also comes with secured alarm system and own paved driveway to the house. Start your easy care living today by moving into this immaculate 3 beds 2 baths unit, open plan dining and living, single garage and functional kitchen. All rooms are carpeted and finished with quality LED lights. This unit is situated within minutes to Balga Primary School, Balga Senior High School and local shopping centre. This home is suitable for young family, young professional or downsizer. This home is too good to miss, call today for a private viewing. Brand new home for rent! Be the first one who stay in this immaculate and quality built home! Presenting this wonderful family home for rent, situated within short distance to Mill Park, bus stop, schools, and shops. Do nothing and just move in! Now you will have the choice of living in this immaculate, quality and brand new apartment, strategically located at the heart of Belmont. We are offering 7 brand new apartments for lease, consist of 1 or 2 bedrooms, stainless-steel kitchen, built-in wardrobe, enclosed laundry and open plan living. Upstairs apartments are perfectly built with balcony and the downstairs apartments are uniquely finished with small easy care courtyard. Do nothing and just move in! Now you will have the choice of living in this immaculate, quality and brand new apartment, strategically located at the heart of Belmont. We are offering 5 brand new 2 bedrooms apartments for lease, featuring stainless-steel kitchen, built-in wardrobe, enclosed laundry and open plan living. Upstairs apartments are perfectly built with balcony and the downstairs apartments are uniquely finished with small easy care courtyard. EASY CARE APARTMENT, MINUTES TO CITY! Do nothing and just move in! Now you will have the choice of living in this immaculate, quality and brand new apartment, strategically located at the heart of Belmont. We are offering 3 brand new 2 bedrooms apartments for lease, featuring stainless-steel kitchen, built-in wardrobe, enclosed laundry and open plan living. Upstairs apartments are perfectly built with balcony and the downstairs apartments are uniquely finished with small easy care courtyard.